Over nine hours of building & tweaking, three hours in the studio, and another three hours narrating & editing generates what? A 7-minute video! Well here's the thing. I'm obviously no Technic specialist, so I tend to avoid the big sets of the line and leave them to the experts. I am however a Porsche fan (and previous owner), and have especially marveled at the GT3 since the 997 debuted. Completed, this LEGO model here is something I'm genuinely happy and proud to own, and I will keep it in my long-term collection. The ability to provide some possible service to viewers with a video is just a bonus in this case. Thanks for reviewing this Jang - great review as always! While I admire the new Porsche set. I think it would have been a massive improvement to have left the car skeletonized to some degree. Jang, I do agree with you completely when you made the comments that it was a shame to have covered all of that mechanical eye candy with so many body panels. 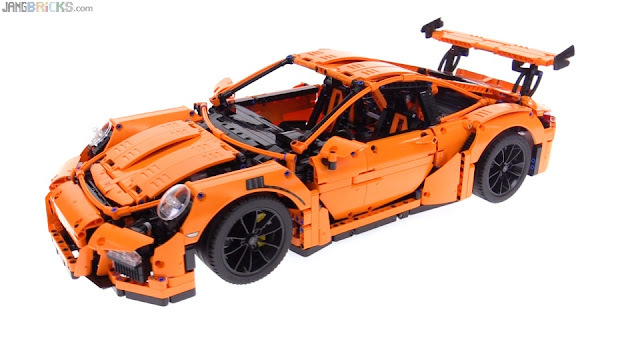 The Porsche is not on my priority list, seeing as I'm saving to obtain the Le Mans race car, but if I do obtain the Porsche one day; I intended to delete several body panels and make modifications so that the mechanics of the vehicle are easier to observe.